Rahr Malting Company, fearing higher energy prices in the long term, has teamed up with an Indian Tribe to build a $60 million, 24 MW bio-energy facility in Minnesota-Koda Energy, LLC-that will use the malt operation's byproduct, as well as a combination of wood and grasses, as fuel. With energy prices seeming to be in constant flux, how does a company budget? 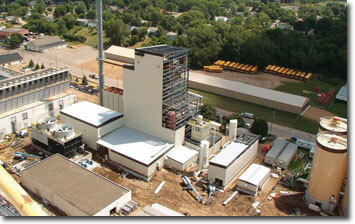 Rahr Malting Company, headquartered in Shakopee, Minnesota, came up with a solution: Produce your own energy. Several years ago, Rahr Malting could see that future costs for electricity and natural gas were on the rise, and those costs were a threat to the company's future. Rahr began looking at alternatives-like using the large volume of byproduct that they were sending offsite (and getting very little money for) and using it to fuel a boiler to produce heat and electricity for the facility. Since Rahr didn't produce quite enough byproduct to fuel a boiler, they began researching to see if there were other byproducts available nearby. They were pleasantly surprised to find large volumes produced by other grain millers and manufacturing industries. And it was upon discovering these larger volumes that the scope of the project became larger as well. Coincidentally, the Shakopee Mdewakanton Sioux Community (SMSC), a federally recognized Indian Tribe located only seven miles away from Rahr, had long been working towards self-sufficiency in a number of areas. Energy independence was a goal of SMSC chairman Stanley R. Crooks, a nationally renowned leader in fostering tribal sovereignty in Indian Country. A number of projects were already in various stages of discussion, planning, and development: a wind turbine, a biodiesel production facility, installation of solar panels, and a water reclamation facility. When Crooks heard about Rahr's interest in biomass energy generation, he dedicated tribal resources to look into the project and marshaled support from tribal members. With the SMSC financing the entire project (Rahr's portion through a loan), the two formed a joint partnership-with the SMSC as the majority partner-called Koda Energy, LLC. (Koda means "friend" in the Dakota language.) And after completing a very thorough permitting process, construction on the 2.5 acre bio-energy facility broke ground in September 2007. About half of the powerproduced by the bio-energy facility will go for Rahr's internal use and the remaining 12.5 megawatts of electricity will go to Koda Energy, and be sold on the grid. As 2008 drew to a close, the $60 million project was on time and on budget. Koda Energy's goal was to be up and running by the end of October and to be at 100 percent capacity by the end of December 2008. The facility will operate 24 hours a day, seven days a week, 51 weeks out of the year, with one week down for repairs and maintenance. "We will have the capability of producing 24 megawatts on our Siemens turbine," says Joe Johansen, general manager of Koda Energy. About half of the power will go to Rahr's internal use-heating the kilns and providing electricity to the plant. The remaining 12.5 megawatts of electricity will go to Koda Energy and be sold on the grid. When it came to choosing a boiler, Koda Energy wanted something reliable and proven. "There was a lot of research that went into the kind of boiler," says Johansen. "We didn't want to get into having a lot of ups and downs in production because Rahr depends upon a constant source of energy for their malting process, so they could not afford to have the process upset. "The boiler used at Koda is the third generation of this type," continues Johansen. "It's a suspension boiler, which means that we take all of our incoming fuel, and we grind it very fine and then spray that into the combustion chamber at various heights. We don't take it in on a conveyor like a stoker or a fluid bed. This way we burn it on the bottom and in the middle of the boiler, and we get a very good yield of everything that we put in." Johansen describes the byproducts material being brought to Koda Energy as "no larger than a jellybean." And then Koda grinds it further to a 12/64-inch size. It's not just the size of the material that is important; the moisture content is also critical. "If a product comes in over 15 percent, then we've got to make some decision whether to allow it in or reject the load," says Johansen. Of the products coming into Koda, wood is the most prone to high moisture content and will be monitored closely. In fact, Koda is including, as part of its contracts with wood and grass customers, a stipulation that moisture content must be under 15 percent as well as how the moisture content will be tested before it's deposited at the facility. Many companies would envy Koda Energy's raw material supply logistics. All material comes from within 50 miles-most of it much closer. 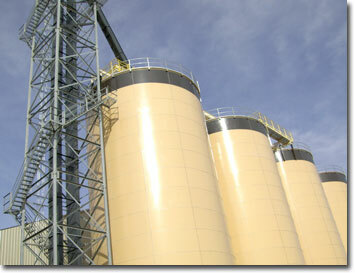 One-third of the raw materials will be supplied by Rahr Malting. With the facility next door, Rahr will just blow the product over. One-third of the material will be trucked in from General Mills, which is located in the Twin Cities. The remaining third will be a combination of wood and grasses. After completing a very thorough permitting process, construction on the 2.5 acre bio-energy facility broke ground in September 2007. As 2008 drew to a close, the $60 million project was on time and on budget-its goal was to be at 100 percent capacity by the end of December 2008. "The wood will come from demolition wood from housing, industry pallets, lumber companies, cabinet manufacturers and so forth," says Johansen. "Koda Energy is not allowed to use any man-made materials, such as plywood or chip board or veneers-anything with glues or resins in it." Once the plant is up to capacity and the materials are coming in, Koda Energy intends to grind 21 tons of raw material per hour. The challenge, however, is not the grinding, but putting together the right biofuel "ingredients." Storage bins have been constructed on the site to hold the wide variety of "ingredients" including wood, oat hulls, barley, sunflower seeds, and grasses. Johansen says they will develop a recipe of sorts from the raw materials. The recipe will be the best combination of materials for the boiler to reduce emissions and create the highest BTU possible. "To meet emissions standards the boiler has a CEM outlet-continuous emission monitoring," explains Johansen. "So when we're putting raw material in, we'll be watching our BTUs and what kind of energy we're producing. But we'll also be looking at our emissions, making sure that we don't violate any emissions standards." 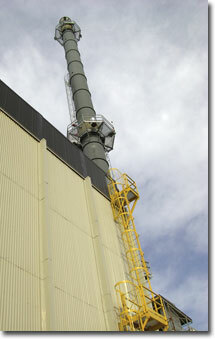 The byproduct or ash coming from the boiler is called fly ash. Currently, Koda Energy is looking to sell it either to the concrete industry or for possible use in making asphalt shingles. The actual design and construction of the facility was assigned to design engineers McBurney Stoker and Equipment Company of Norcross, Georgia, which also manufactured the boiler. Even though this is the first facility of its kind in Minnesota, "it's pretty much a cookie cutter for them (McBurney Stoker)," says Johansen. "They've done this before, so the issues of construction are pretty routine for them. They were chosen because they are experts at this." It's definitely a turnkey project. Johansen sums it up succinctly: "They design it, build it, train us, and then turn it over to us." Even though Koda Energy may not have had the challenges involved in constructing the facility, they did have the important challenge of finding and hiring qualified people. "This is a technical operation, so you can't just walk in off the street," says Johansen. "In the State of Minnesota, a boiler operator has to be licensed. So we need to make sure we hire people with the right license." Once the facility is up and running, that will hardly be the end of the project. For example, the SMSC is working to become a future prairie grass supplier. This past summer the Community restored 400 acres of former farmland to native prairie in a cooperative project with the Minnesota Department of Natural Resources (DNR) and the University of Minnesota. The grasses will be harvested and their BTU evaluated. Dr. David Tillman from the University of Minnesota, who does research on which mixes of prairie grasses will work best for biomass and cellulosic ethanol projects, conducted his research on 870 square-foot plots. The information he's gathered is being used by the SMSC staff to further develop this research using production scale 40-acre parcels. "We are looking for which mixes give us the most amount of biomass per acre for the least cost and are perennial. We need it to come up every year," says SMSC Department of Land and Natural Resources director Stan Ellison. "There are a lot of variables to be determined through research. Nobody else is doing exactly this: growing native prairie grasses on a large scale for a biomass project." Excitement is building as the facility nears completion. And one of the high points of this project so far has been the reception it's received from the local community. "We're right in town in Shakopee and so the community-both the city and the neighbors-have been very, very cooperative," says Johansen. "I think it has to do with Rahr's standing along with the SMSC's reputation as a good neighbor. Both entities have a long history in this area." But Johansen is also proud of the part this facility will play in the renewable energies industry-in particular the use of grasses on marginal lands. "I was in the ethanol industry for about 15 years, and this is the next step on the renewable energy front, where we don't compete with food for the table," he says. "We can take marginal land that's unused right now, and we can make it productive and keep our money, our energy, and our people local. It's coming quickly and it's going to catch on."